This weekend is the Country Music Marathon and Half Marathon, and once again – we are expecting to get rained on for the race. Whether it rains or the sun is shining, it’s very important to have a few essentials, so I thought I’d remind you guys with a checklist of a few things to prep with the night before! A HAT!! If it’s raining – you’re going to want one FOR SURE to keep the rain out of your eyeballs. Good running shoes that you’ve trained in. It all starts from the feet so make sure your shoes are in good shape and ready to go. 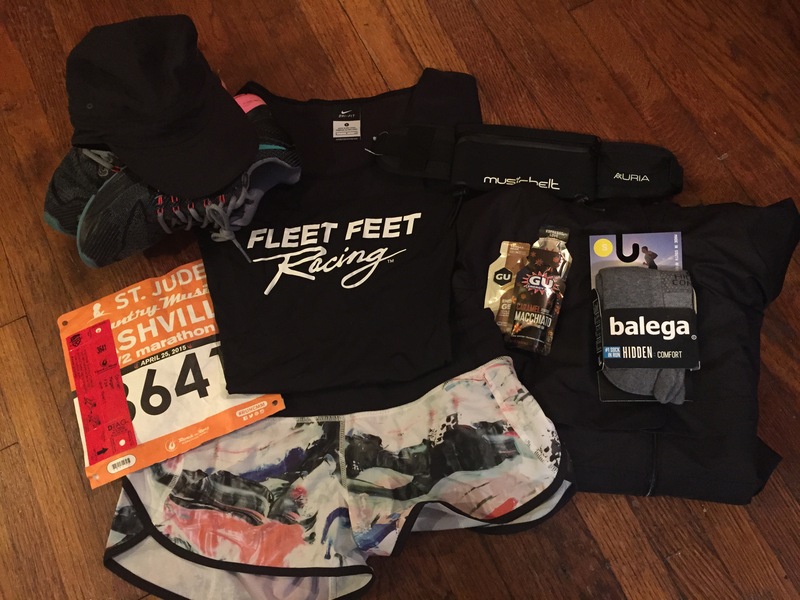 If you’re thinking of doing a race and need some new kicks – go to Fleet Feet and they will get you sized up and ready to go! Your outfit! You want to make sure to have something that you’re comfortable in and that you’ve run in before. I love Lululemon’s Speed Shorts and of course I have my awesome Fleet Feet racing jersey. Girls – make sure you have a good, supportive bra! Lube – speaking of bras… you’ll want to use some body glide ladies or vaseline around your bra line to help with chaffing. Guys – lube up your nips or think about bandaids. Trust me, you’ll thank me later. Sunscreen – if you’re fair skinned or running the full – put some screen on ya! You’ll be out there for a couple of hours regardless – if you’re running the half with waiting and after race activities – so protect your skin! Socks – Balega are my MOST favorite socks. I also picked up a few pairs of these at Fleet Feet. Nothing like a fresh new pair of socks! Maybe you like compression socks, or whatever you like – just make sure you have some good ones and that you’re used to the way they feel. GU – mucho important! I choose Gu Energy because it’s easy to carry and access. No chewing, just gulp it down and it’s great. There are tons of great flavors out there. Huma Chia gels are a really tasty choice as well. I take a Gu every 5 miles to give me a little umph. Race belt – This is a great choice, and I picked up a new one at the Expo today that has a waterproof pouch since we are expecting rain. You can put your Gu’s in there, your phone, ID, money, it has a place for earphones to go through and you can attach your number to it as well. Stash some cash! – For this race, the finish and start are not very close to each other, so you might want to stash some cash in a pocket or race belt in case you end up needing a cab ride, can’t get an uber, or you need a snack soon after the race (and the free snacks didn’t cut it). It’s always good to have a little on you in case of an emergency. Race number – get this guy in place as well as your chip the night before. This will take a few minutes off of your prep time the morning of. A new playlist – if you’re a runner that likes music – make yourself a new playlist of songs that you love or listen to an album that you’ve been wanting to hear. I made an open playlist for my Vegas marathon and people added songs to it – which was so fun!! A GREAT attitude – rain or shine, wear a smile on race day! It’s a privilege to be able to run and cover this amount of distance. All of your training and hard work will pay off when you cross that finish line! Remember when you think you can’t go any further that you CAN. Believe in yourself and you’ll get there! Happy racing everyone!! Have a great race!!! ← From Open Heart Surgery to a Half Marathon – Elyssa Goldstein a True Inspiration!